Aunt Seroghli – although never seen in the story she is an important character in that she translates the letters! The story is unusual in that it is told in a series of letters between Baryut, the boy from Mongolia and Kitty, a British girl. Baryut lives in the Mongolian mountains and his family herds horses. One day whilst out looking for two missing horses from his herd he comes across some wild horses. He knows that these wild Mongolian horses are extremely rare, almost extinct and he is very excited. Over time he finds more of the wild herd and begins to track them, in particular he is drawn to a young stallion he calls Tachi who seems far more intelligent and cunning than the other horses. However although he tries to keep the herd a secret, the authorities eventually find out, and in their wisdom decide to capture some of the horses and start breeding programs throughout the world. One such program is to be conducted on a Welsh nature reserve which is run by Kitty’s grandfather. 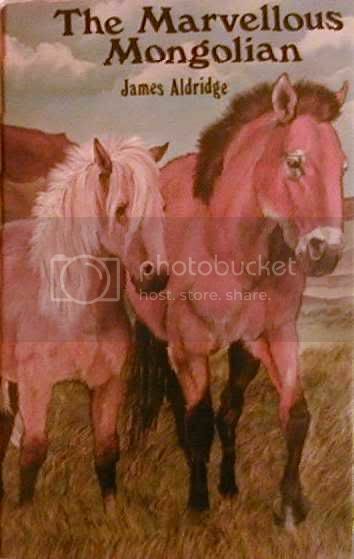 The plan is to capture a stallion who will become a mate for Peep, the Shetland pony there whom Kitty has grown to love. Baryut is devastated when his favourite stallion Tachi is captured and chosen as the horse to send to Wales. He is worried that Tachi will be too ferocious and too cunning to be suitable. It is when this happens that he starts writing to Kitty to try and explain to her about Tachi. Tachi eventually arrives at the reserve and Kitty starts to write back to Baryut to continue the British side of the story. She is amazed at Tachi and how wild and strange he seems. It is heartbreaking for her to see her beloved Peep left all alone with only the fierce and unfriendly Tachi for company. But in time the two ponies become friends. But then disaster strikes. Tachi, as Baryut feared, is too cunning to be trapped for long. He escapes, taking Peep with him. The rest of the story follows the adventures of Tachi and Peep as they embark on an amazing journey, always eluding capture, culminating in an even more amazing climax. This is an extremely unsual pony book, not set in the usual mould at all. Everything about the book is out of the ordinary. The subject matter – that of a wild Przewalski horse (also known as The Wild Mongolian Horse) and a breeding programme is unusual. So too are the settings and happenings, especially in the Mongolian part of the story. Even the narrative style, being told via a series of letters is no longer common (although it was a very popular style many years ago). The book has been well-researched. The Mongolian settings ring true. And it is obvious that the author has done his homework on the breed itself, and the nature of the Przewalski horse. In this particular edition there is also a fascinating snippet on the back flap of the dust jacket which tells how the author talked to a director of the Prague Zoo where there was a collection of Przewalski horses and found out that one of the keepers had actually been killed by one of the horses, they are really that fierce! Although much of the action takes place between the horses, there is nothing Disney like about their interaction. They do not talk together. The author stressed that he did not want his book to be anthropomorphic. The horses’ actions and movements are therefore commented upon and reconstructed by Baryut, Kitty and the other accounts of people who met the ponies on their journey. In fact the book is if anything fairly uncompromising with some parts that are a little upsetting in their frankness. The characters of both ponies are however well-defined, especially that of the fierce, cunning and super-clever stallion Tachi. The plot starts off being very original but I feel that there is too much of the story taken up by Peep and Tachi’s escape and subsequent wanderings. It does tend to turn into a sort of ‘incredible journey’ type story whereas I feel it would have been more interesting to have seen more interaction between the two horses in the reserve or for there to be more about the wild Prz horses in their native setting. However this is probably the only gripe I have with the book, and a fairly minor one. The characters of Kitty and Baryut are excellently drawn, with their contrast in lifestyles highlighted by the detailed explanation of many of the customs of the Mongolian people. The letter form may sound a bit stilted but in actuality makes for a flowing narrative. The first person perspective inherent in this form also draws the reader quickly into both the story and the characters of the two main human protaganists. I would recommend this book to anyone who would like to read something a little bit different than the normal run of the mill pony story. It is also full of information about a different culture as well as giving valuable information about a very rare breed of horse, which makes it an excellent read for anyone who likes to learn whilst they are being entertained! I've rated this book 4 horseshoes as I really enjoyed it. Even though it became a bit unbelievable in some parts I still wanted to find out if Tachi and peeps make it back to the mongolian mountains.